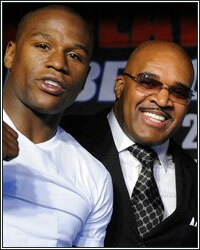 LEONARD ELLERBE: "FLOYD CAN FULFILL HIS COMMITMENT TO LAS VEGAS AND DELIVER HIS PROMISE OF THE MEGA-FIGHT"
"We are pleased that the judge has granted postponement of his surrender date so Floyd can fulfill his commitment to Las Vegas and deliver his promise of the mega-fight and the economic benefits it will provide to the community," Mayweather Promotions CEO Leonard Ellerbe would comment when news first broke about the judge's decision to postpone Floyd Mayweather's surrender date until June 1, 2012, allowing him to move forward with his plans for a mega-fight on May 5, 2012. Mayweather was due to surrender himself today to begin serving his 90-day sentence, but his attorney's requested a continuance, sighting an agreement with the previous district attorney, who allowed him to commit to a May 5 fight before the offer of a plea bargain was on the table. Ellerbe was short with his comments, no doubt offering up a similar blanket statement to the numerous callers who were contacting him, but he added, "Floyd has a great legal team and me and Al [Haymon] have been working around the clock. We probably had 2, maybe 3 nights of sleep since the sentencing, working around the clock on this, practically living in our attorney's offices." That being said, the fact that they were hoping to postpone Mayweather's incarceration in hopes of being able to move forward with a fight on May 5 should make it clear that they're willing to do whatever it takes to make the fight with Manny Pacquiao as soon as possible. Now that Mayweather is still available to fight on May 5, will Bob Arum add his name to the list of potential challenges he plans on presenting to Manny Pacquiao next week? Personally, I don't think so, but if you're an optimist, there's still hope.